Objective: To elucidate the nature of the etiologic relationship between personality and major depression in women. Design: A longitudinal twin design in which twins completed a time 1 questionnaire and, 15 months later, were personally interviewed for the occurrence of major depression during the last year and completed a time 2 questionnaire. Both questionnaires contained short forms assessing neuroticism and extraversion. Participants: 1733 twins from female-female pairs ascertained from the population-based Virginia Twin Registry. Results: Extraversion was unrelated to lifetime or 1-year prevalence of major depression. Neuroticism was strongly related to lifetime prevalence of major depression and robustly predicted the prospective 1-year prevalence of major depression in those who, at time 1, denied previous depressive episodes. However, controlling for levels of neuroticism at time 1, levels of neuroticism at time 2 were moderately elevated in those who had had an episode of major depression between times 1 and 2 ("scar" effect) and substantially elevated in those experiencing an episode of major depression at time 2 ("state" effect). In those who developed major depression, levels of neuroticism did not predict time to onset. In the best-fit longitudinal twin model, the proportion of the observed correlation between neuroticism and the liability to major depression that is due to shared genetic risk factors was estimated at around 70%, that due to shared environmental risk factors at around 20%, and that due to a direct causal effect of major depression on neuroticism (via both "scar" and "state" effects) at around 10%. 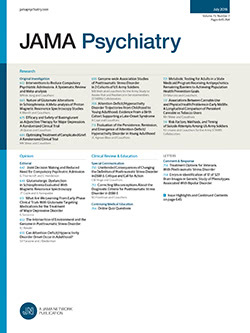 Approximately 55% of the genetic liability of major depression appeared to be shared with neuroticism, while 45% was unique to major depression. Conclusion: In women, the relationship between neuroticism and the liability to major depression is substantial and largely the result of genetic factors that predispose to both neuroticism and major depression.